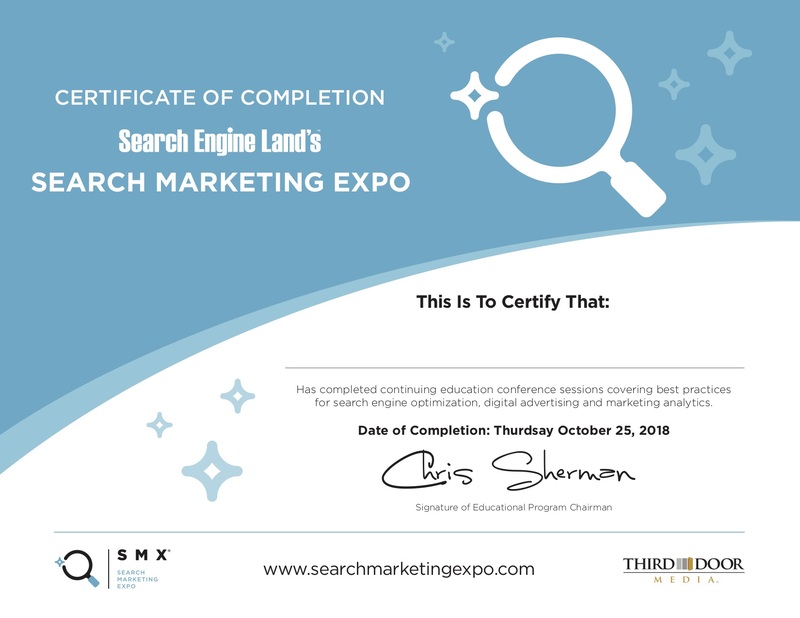 The SMX Certificate of Completion is a great way to verify you attended the event (perfect for travel and registration reimbursements), beef up your CV and resumé by demonstrating your dedication to continued training, and showcase your involvement in the industry and SMX community. Stop by the registration desk at the conclusion of the show and ask for your official Certificate of Completion. You can also email registration@searchmarketingexpo.com after the show to request a Certificate of Completion. Want to register by phone or have questions? Call (877) 242-5242 Monday-Friday from 9:00AM to 5:00PM EST. Or e-mail us at registration@searchmarketingexpo.com.